If you have worked in the United Kingdom it is probable you have overpaid tax. We are here to help you get it back! Most people who work in the United Kingdom pay income tax through the Pay-As-You-Earn (PAYE) system. Through this system the employers withhold Income Tax and National Insurance contributions. There are many factors that may influence the amount of these taxes and result in overpayment. You can get an average refund of £974! Apply today! Let our experts take care of your tax matters! No need to waste time, worry and deal with the Tax Authorities – we will do it all for you! 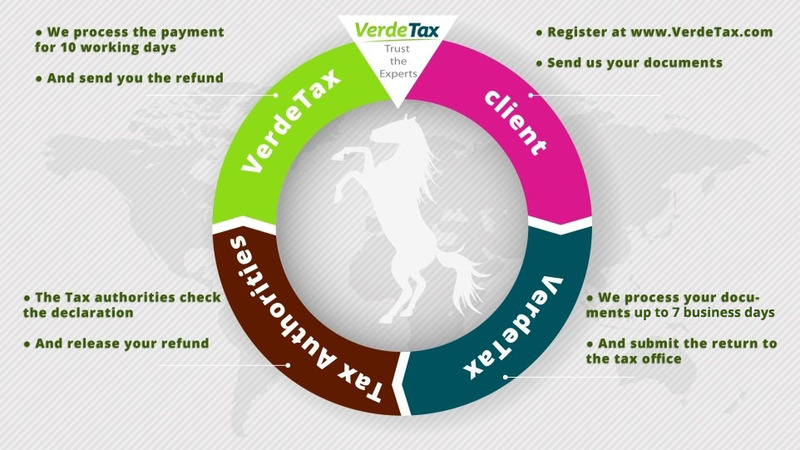 We can help you refund your income tax. For nationals of the European Economic Area (EEA) the National Insurance contributions are non-refundable. Original P45 form from each employer – we cannot file your return with copies. P45 is a form you receive from each of your employers after you leave the employment. It shows your earnings and the deducted tax for the year so far. Copy of P60 – if you have worked in the UK for more than one tax year and have received a P60, we need a copy of it. P60 is a form you receive from each of your employers at the end of the tax year. It shows your earnings and the deducted tax for the year. Copy of your passport/ID card – we need them in order to confirm your personal details and citizenship. Completed and signed VerdePack – this is our company set of documents. We will need you to fill in, sign and send it to us, so we can start your refund process. Usually, it takes around 3-4 months for the Tax Authorities to issue your refund. If you are still in the UK and want to apply for a refund, you need to wait for the end of the tax year. If you have already left the UK you can apply at any moment, even if you are applying for the current tax year. What the duration of the tax year? In the United Kingdom the tax year starts on 6th of April and ends on 5th of April the following year. You can claim a refund for 4 years back including the current tax year. The National Insurance number (NIN) is a tax number used to identify each taxpayer and ensures proper deductions of the Income Tax and National Insurance contributions. You can find the number on your P45 and/or P60 and on any correspondence received form the Tax Authorities. If you received income from other than employment you are obligated to file a return. We advise you to file a return; it can often result in a refund for you. You pay no up-front fee. We will deduct a fee once the refund is received. If a refund is not received there is no fee due. Register through our website and send us the necessary documents. Our team of experts will process your information up to 7 business days and will submit it to the Tax Authorities. One the tax office receives your documents, it takes around 3-4 months for them to release your refund. One we have the refund, our financial department needs 20-30 business days to process the payment and send your refund.